Sweat that accumulated on the Marine’s face was quickly washed away when he leaped from the dark tunnel into waist high water. Moments later he was met by a fellow Marine. Although fatigued, both fought until one was overpowered and forced underwater. 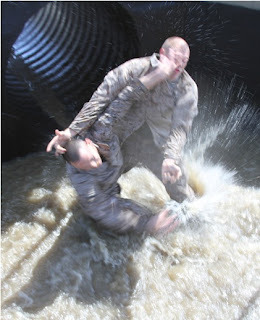 These Marines, on training day five of the Martial Arts Instructor course held here at Marine Corps Recruit Depot San Diego, had just finished an obstacle course and full-gear hike around the base and were now fighting in a flooded, concrete structure known on the depot as "the bear pit." The class is broken down into two squads. Each squad has a Martial Arts Instructor Trainer to see who is excelling and who is having a tough time. Most of the Martial Arts Facility Instructor Trainers are drill instructors who know the importance of both physical training and emotional mentorship. “If someone is hurting, their Martial Arts Instructor Trainer can use their mentor side to get in the student’s head and tell them that every one’s hurting, not just them,” said Gonzalez. Martinez, a Passaic, NJ native, and 3rd Battalion senior drill instructor, explains the course is very demanding, but his drive for signing up for this course was to better himself and others. “I want to go back to the fleet as more of an asset,” he said. The MAI course consists of more than just martial arts. The students are also taught how to stay physically fit with everyday material, and covers how to be a better mentor and instructor, which Gonzalez says go hand-in-hand. The main goal of the course is to create MAIs who are good role models, leaders, and make Marines they train better in their personal lives. offered at MCRD four times a year to noncommissioned officers and above with at least a gray belt and a year or more remaining on their contract. In addition to the administrative requirements, Gonzalez recommends that Marines taking the course be in peak physical condition since it is very demanding on the body. "You need to be in good psychical shape with no injuries – especially no shoulder injuries in the past two years," he said. "You are also required to have a first class physical fitness test and combat fitness test." Staff Sgt. Luis R. Martinez, a student in the MAI course, recommends aspiring students do pack runs to help become physically ready. 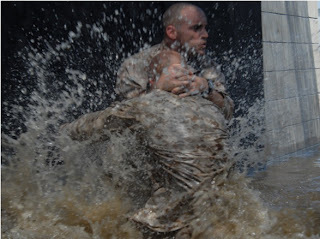 Just because a Marine meets the requirements for the course does not guarantee they will succeed. According to Gonzalez, the average course drops approximately three of the original 28 students, mostly due to being unprepared. “The most important thing is to be 100 percent committed,” he said. According to Sgt. Jaime Soto Jr., Martial Arts Instructor Trainer at the depot’s Martial Arts Training Facility, 100 percent commitment comes from both mental and physical preparation. Soto, a Torrance, Calif. native, hopes the course makes better MAI’s who can pass down the knowledge they learned here. “This course is here to build better Marines, everyone should strive for it,” said Soto.